With the NFL season just starting, I decided to make this blog about one of the biggest ongoing problems in the NFL right now. The debate over concussions has been going on for years and it has been concluded that concussions can cause some permanent brain damage. So now the question of whether or not it’s worth it arises. Some people say yes and some people say no. My blog will be an opinionated or biased piece but it will inform you enough for you to make your own decision. 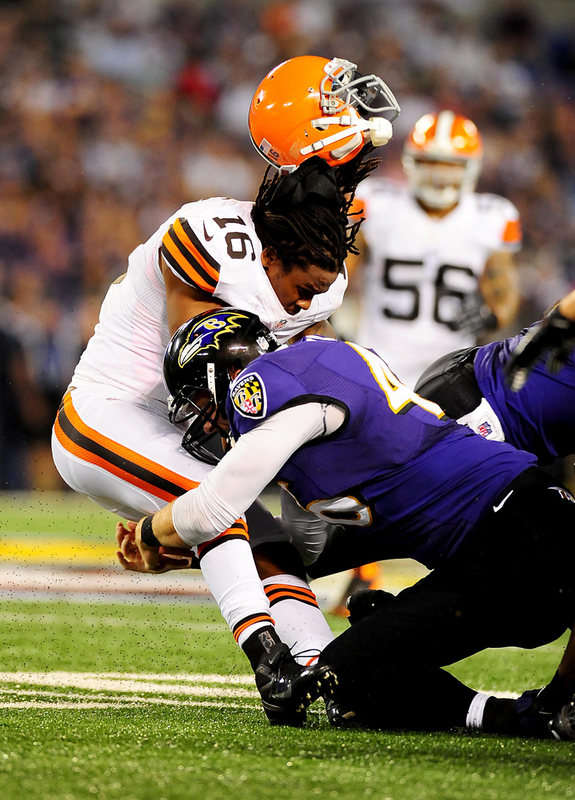 So what exactly is a concussion? Well, according to the CDC website, a concussion is a MTBI ( Mild traumatic brain injury) that is caused by a hit to the head or by violent shaking of the head and body. Clearly in the NFL, each player receives a countless amount of hits/blows to the head, not even counting the ones they received in their high school and college careers. However, treating concussions is easy. You do not continue to play the sport until all concussion symptoms are gone. Sounds harmless, right? That is what everyone thought until Dr. Bennet Omalu discovered chronic traumatic encephalopathy (CTE) in football players and its link to head trauma caused by football (Breslow). In 2002, Dr. Omalu was assigned to conduct the autopsy of Mike Webster, former steelers center. When examining the brain, he noticed CTE, which is a progressive degenerative disease of the brain ( Boston University Website). This finding was huge was later linked to concussions and repeated hard hits to the head. I could go into much more details about his discoveries but I want to focus more on concussions in the NFL today and how they are preventing more brain injuries. But in essence, this is how concussions became such a large problem. So what measures are the NFL taking to prevent more and more injuries? Well they are doing multiple things. From personal knowledge, helmets are getting more safe because the pads in the helmet absorb more and more of the shock from the hits. When I was in high school, every year a representative from Riddell ( the company who supplied our helmets ) would give a presentation to our whole team each season describing how the pads in the helmet were more shock absorbing. Riddell is one of the two companies who supplies the NFL with helmets. The other is Xenith. To get a more in depth look at the technology of these helmets, you can just visit their websites. Another precaution that the NFL is taking is that they are introducing more penalties to protect players from helmet to helmet collisions (NFL.com). These precautions are not only being implemented at the professional level, as these new penalties have also been introduced to the college and high school level. This entry was posted in Uncategorized on September 15, 2016 by Anthony Guerino Lopresti. My title probably gives it away. I am one of the biggest procrastinators of all time. I wait until the last minute on almost everything; just like this assignment. It is Thursday, September 15th, and this assignment is due to tomorrow by 12:00pm. I have always wondered why I procrastinate. No one in my family is like me. My sister was always ahead of her school work and never had to cram. My mom and dad are both the same way. So where do I get it from? Not just me, but why does anyone become a procrastinator? So I decided to do some research. 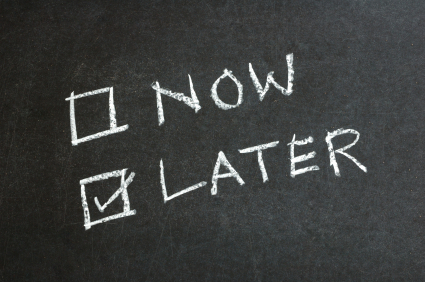 This articles includes 9 reasons why you procrastinate and 9 ways to stop. In this blog, I am only going to focus on a few of the reasons why, but I may touch on the ways to stop in another blog. Anyway, according to Psychology Today, procrastination can become a habit that you picked up from someone else. This article uses the words ” role model ” but essentially, they are saying you can get it from anyone that you are around a lot such as a family member. 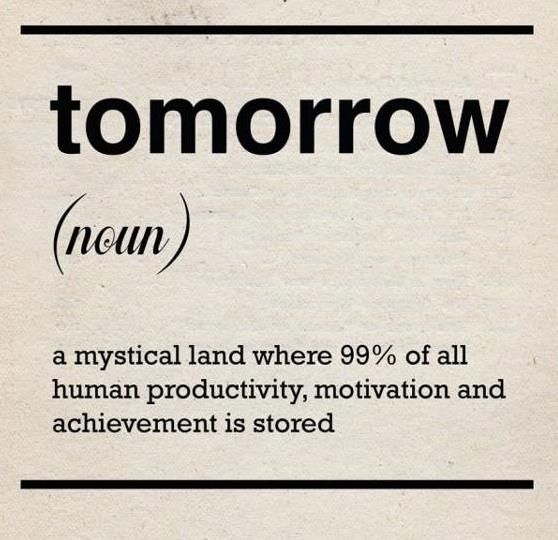 However, I come from a family where procrastination does not exist so I have ruled out this explanation for myself. Another possible reason is that you may severely underestimate how much time it will take you to complete the task (Garcy). Now I have definitely done this before. I think that I can work a lot faster than I actually can. In high school, that was not much of a problem because I never had to turn something in by a certain time. Everything was handed in during class. So if I underestimated how long an assignment would take me, it would only usually only mean that I would stay up very late completing the assignment but it would get done and i’d turn it in the next day. However, now everything is turned in online and by a certain time. So if I wait until the last minute (which I usually do) and also underestimate how long it will take me, I could end missing the deadline all together and getting a zero. So this is one of the causes of my procrastination and it is definitely a problem that I need to fix. This next reason is the last one that I am going to look at and is honestly one of the biggest reasons for my procrastination. 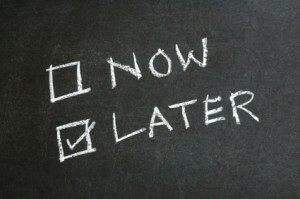 Psychology Today states that one could procrastinate because you have bias against a certain kind of task or assignment. 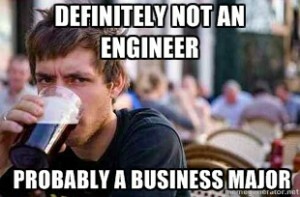 For example, I always do my econ homework way before it is due. it’s all online, multiple choice questions that are not very difficult so I always get that out of the early. However, when it comes to writing assignments, such as one like this, I push it off until the last possible second because I hate writing. So this reason is probably one of the biggest causes for my procrastination. I have a very big procrastination problem. I have always wondered what causes it and I am starting to find out exactly what it is. If you do not usually procrastinate, I strongly advise against it. I would never consider being a science major because it was by far worst subject in high school. I am currently undecided, as I said before, but I am thinking about going down a path in business. My top two picks to major in are finance and economics but I am still not a hundred percent sure. The reason I am choosing a business path because I really working with numbers. I liked Algebra in high school but I also took pre-calculus which I hated but still, I like numbers so I am most likely headed down a business path. This entry was posted in Uncategorized on August 31, 2016 by Anthony Guerino Lopresti.